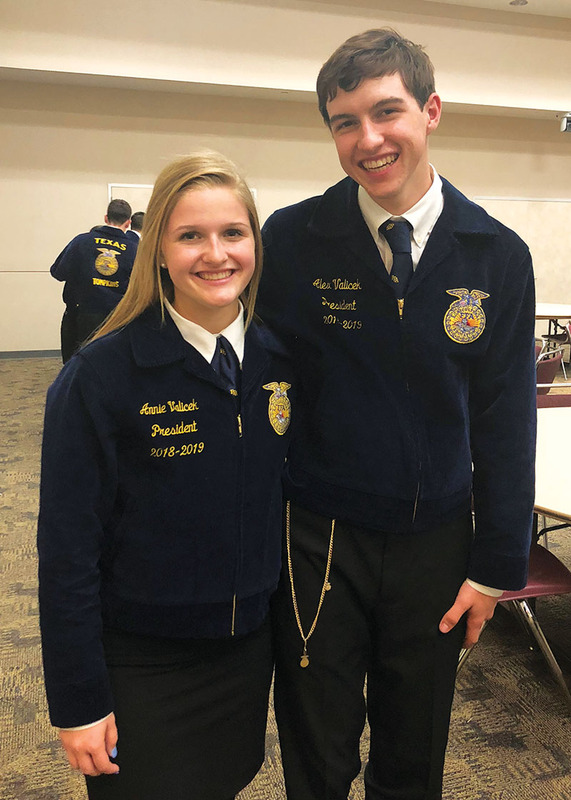 FFA FAMILY Annie Valicek, a junior at Memorial High School, is president of both the Spring Branch FFA chapter and the Texas FFA Lake Houston District. Here she’s pictured with her brother Alex, a senior at Memorial High School and president of Texas FFA Area 3. Since I was in fourth grade, I have been raising chickens to show at the Houston Livestock Show and Rodeo. It has been an experience full of hard work, new friends and a lot of fun. Raising broilers, or show chickens, is only a six-week project – my mom says it’s like having a bunch of infants to care for 24/7, but it is only six weeks! Doing this with my family – mom, dad and two siblings – has been a great opportunity, and we love being involved in all things FFA together. In my freshman year in high school, I was thrown head first into an organization that has brought me more relationships, growth and joy than I could ever imagine. During my three years in FFA, I have raised chickens, rabbits, a lamb and a pig, along with being involved in many public-speaking events and leadership roles. I am now a chapter and district officer and was on two state-qualifying leadership-development event teams this year. I have learned so many things and met so many people. Every year, SBFFA hosts our annual Show & Sale that gives students the opportunity to compete with our livestock and non-livestock projects. This is my favorite time of year, and I love to see the community come support our kids and learn about all of our endeavors. I have participated in this show for three years with my animals and also with non-livestock projects. I have built a cedar swing and a hat rack, and have entered photography pieces and baked goods. On Friday, Feb. 1, we will show our animals, and I will compete with my pig and rabbits. Saturday, Feb. 2 is one big party, as we celebrate our hard work and auction off our projects. I am so excited for this Show & Sale that is expected to make history, and I hope to see all the smiling faces from our community out at the SBISD Ag barns (1905 Brittmoore) to see all we have to offer. See springbranch.ffanow.org.